Formulation1 is one of the brands that doesn’t seem to have that big of a presence online but they do crop up on my Instagram feed from time to time. I’ve seen actually one of my favorite fitness chick accounts to follow uses their BCAA’s, and she’s incredibly ripped so of course in my head I was like, oh, well, if this is the stuff that she’s taking, then I think it’s the stuff that I should be taking, right? It’s hard to have any OTHER mindset. That’s how it works with Instagram though. You see it. You buy it. But since BCAA’s are boring I decided to go with the Formulation1 Pre Workout instead. Let me first and foremost discuss the flavorings. What’s the best flavor of Formulation1 Pre Workout? Watermelon: The watermelon flavor of Formulation1 pre workout is really quite good. Some of these pre workouts have all started to taste the same to me, but this watermelon Formulation 1 was really, really tasty. It was sweet, but balanced out by sour. It was a tiny bit grainy at the end of the pre workout drink, but that is to be expected with these pre workout products. Cherry Lemonade: The cherry lemonade is technically the ‘worse’ flavor of Formulation1 Pre Workout but really it’s also pretty good. I would give it an 8/10 whereas the watermelon is a 9.5/10. One thing you should keep in mind about the cherry lemonade is that the CHERRY sort of gets lost against the lemonade. Just meaning that it’s less of a berry / cherry flavor and more of a sour punch. But. It’s still quite good. Overall if I average out the two flavor grades you end up with an 8.7/10 on flavor. Not a bad start for the Formulation1 Pre Workout. But how does it work? Do you get better workouts when you take it? Call me crazy. No. Really. CALL ME CRAZY. Do IT. Lol. So pushy this morning. My bf didn’t mind though. Bahaha. Ok. Pull it together. But. The Formulation1 Pre Workout actually performed much better than I thought it would. The workout that I did yesterday was actually a BBG meetup with some of my favorite BBG Inland Empire gals. We pushed through a sort of custom arranged deathbyKayla workout, and then we all went out to brunch after. But. The workout. The workout. The workout. I took a scoop of Formulation1 pre workout about 10 minutes before getting things started, and I was CRUSHING legs. Like. Really hammering away on them. I could tell when my body wanted to give up but my MIND get telling me that I could keep going. That’s the best part of Formulation1 pre workout by far- it’s the mental side. I felt like a Goddess between the ears. I also had a feeling of euphoria and ultimate energy that I haven’t had from a pre workout in a while. My endurance was good, but it was a function of the brain. Like I said, I felt like my body itself physically wasn’t being supported or altered all that much with Formulation 1, but the the mental element was IMMENSE! I kept things going all the way until the end of the workout and then SORT OF felt like I was going to pass out unconscious. But I didn’t. And we went and had mimosas and bacon and eggs. Like true BBG fatsos. Lol. But let me get back to Formulation1 Pre Workout and tell you what’s in it. The formula of this pre workout is what really makes me scratch my head. I stopped looking at pre workout formulas before taking them because I don’t want it to cloud my judgement of what works and what doesn’t work. Sometimes I’ve read the label of a pre workout before a review, and then all of a sudden I have this pre-conception of how it’s going to work. And then, wouldn’t you know it, that is how the product ends up working. It’s not that great of an experience because you start to ‘Formulate’ (lol) an opinion of how the product performs. As you can see why I’m confused. The formula itself is nothing special in any way. In fact I would go as far as to say it’s quite UNIMPRESSIVE. You have Vitamin B, followed up by beta-alanine, L-Arginine-Alpha Ketoglutarate, L-Citrulline Malate, Taurine, N-Acetyl L-Tyrosine, Caffeine, and Phenylethyamine HCI. 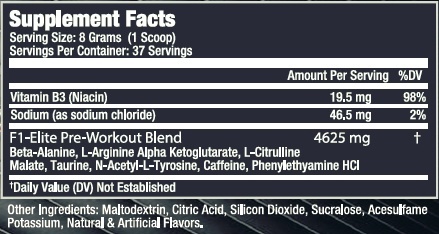 That’s not the most extensive list of ingredients that you’ll see in a pre workout. Especially in this modern day of the ‘big blend’ pre workout where the products seem to contain every single ingredient under the sun. If you’ve ever had Pre-Kaged pre workout, you know what I’m talking about. This formula isn’t necessarily ‘bad’, but you should know it’s rather ‘low-end’. Which is a little bit confusing, because I had a freaking GREAT workout with it! I’m not sure how or why, but this pre workout seems to defy the odds when it comes to the formula/performance alignment. The formula is bare-bones and really only contains like 4 grams of active ingredient whereas other comparable products contain closer to 10. Formulation1 Nutrition Pre Workout also contains maltodextrin as one of the ‘other’ ingredients, which means basically that a good amount of each serving is just filler. This is where it does get a little ugly for Formulation1- pun intended. There isn’t much to love about this pre workout, visually speaking. The product starts with a black background that does provide contrast to the elements that lie in front, however, the graphics in front don’t exactly rub me the right way. The entire design suffers from a very serious case of the skeumorphisms. That’s not really a word in the plural sense but what it means is that all the elements use really sharp bevels, shadows, and attempts to create a ‘3D’ look that doesn’t really exist. It’s not the ‘modern way’ of design. I don’t really like the look personally. It looks cheaply made. The background graphics look like the X-men door that the wheelchair guy rolls through to get to his special mind-control arena thing. You know what I’m talking about? Kinda? Lol. I think dudes would find this design more attractive than me, but honestly it makes me think that this pre workout is for guys only. I don’t find it particularly appealing. Like. At all.